‘Kaul’ exposes how afraid we are to even acknowledge these questions we have always had, rooted in deepest recesses of our minds, and it makes us confront them. As thrilling as it is visually stunning, it is a film that should not be missed. I watched ‘Kaul’ at the 2015 Jio MAMI Mumbai Film Festival. It reminded me of another existential drama that premiered at MAMI in 2014; a Malayalam Film ‘Asthamayam Vare’ (Unto the dusk), incidentally a debut feature as well. Its non-linear narrative makes viewers privy to a man’s struggle in hunting for and dealing with the meaning of his life. ‘Kaul’ however goes one step further. 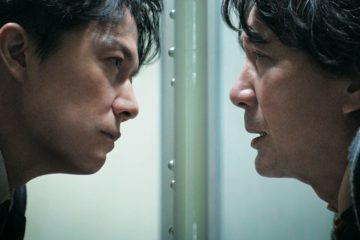 It successfully makes this existential struggle so subjective that it no longer takes place just on the screen but in the viewer’s mind itself. Very rarely is a film capable of more than making the viewer empathize with a character’s plight. ‘Kaul’ makes the viewer experience it first hand. We get into the film as we follow a school teacher after he mysteriously leaves the city to take up a village job. A few inexplicable incidents lead him to question his sanity and hence to a psychiatrist. The doctor assuages his worry and asks him to go back to the location of his allegedly metaphysical experiences and confront them. So he returns and stumbles on the old man who had appeared on his previous visit, in the death of night, to ask for a matchstick. Turns out, he was not a hallucination but is as real as the magical incidents that the teacher now recounts to him. The old man claims they were all absolutely real. We embark on an odyssey on which the old man; deemed to be insane by the villagers, takes the teacher. He speaks about “Neti, Neti” an expression in the Upanishads and the Avadhuta Gita which means “neither this, nor that”. A way of thinking that rejects everything that we hold to be true and real—a search for real meaning or self-identity. Debutant director Aadish Keluskar, who studied at FTII, has made some strong choices that add to the obscure nature of this narrative. Shooting a large chunk of the film in darkness, illuminated only by torch light makes for some wonderful scenes; particularly one where the light cuts through grass making beautiful illuminated ribbons of green. At one point the teacher is cycling with the camera put right under his face. There are homages to Hitchcock and Truffaut in shots that are built up to be tense, dark and claustrophobic (backed up by the booming and beautiful background score) and then snap to a wide, lit and silent frame. There is wonderful chemistry between Keluskar’s direction, Ameya Chavan’s cinematography and the editing by Keluskar and Samira Kidman. The movie opens with a quote from Nietzsche “And those who were seen dancing were thought to be insane by those who could not hear the music.” We see the teacher, portrayed completely unselfconsciously by the actor Rohit Kokate, literally dancing to some mystical inaudible music. His acting shines brilliantly when he delivers the final monologue. Thus Spoke Zarathustra, A Book for All and None (Sprach Zarathustra, Ein Buch für Alle und Keinen) is one of Nietzsche’s most famous works. Zarathustra, is a solitary, reflective, exceedingly strong-willed, sage-like, laughing and dancing voice of self-mastery who envisions a mode of psychologically healthier being beyond the common human condition. It is easy to draw parallels between Zarathustra and the prophetic old man in the film. The teacher is reminiscent of Meursault from Albert Camus’ ‘The Outsider’ with his detached behaviour and lack of traditional human morals. ‘Kaul’ pits various philosophical ideas, those of Nietzsche, Camus and Hinduism against each other and also adds a simple explanation of mental illness in the mix (which is at the same time easy and difficult to accept). One of the most intimate moments in this film is during the old man’s monologue rejecting all ideas and institutions that we hold to be dear and true, his words are juxtaposed with grand spectacles of nature; vast mountains covered in fog in a montage with the teacher’s routine activities and a sleeping dog. Comparing our limited existence to the endlessness of nature and making us question the meaninglessness of it all. A few shots in this sequence look curiously like Caspar David Friedrich’s painting ‘Wanderer above the sea of fog’. The experience of the film would have been devastatingly compromised without the brilliant sound design combining ambient sound with music. It is at its best during the climax where the music builds up, exaggerating the horrifying possibility of the old man’s words being true. I let out a silent sigh of relief at the old man’s sudden murder, putting an end to his proclamations and the growing dilemma in my mind. I cannot remember a film that made me feel such relief at such a horrific death.